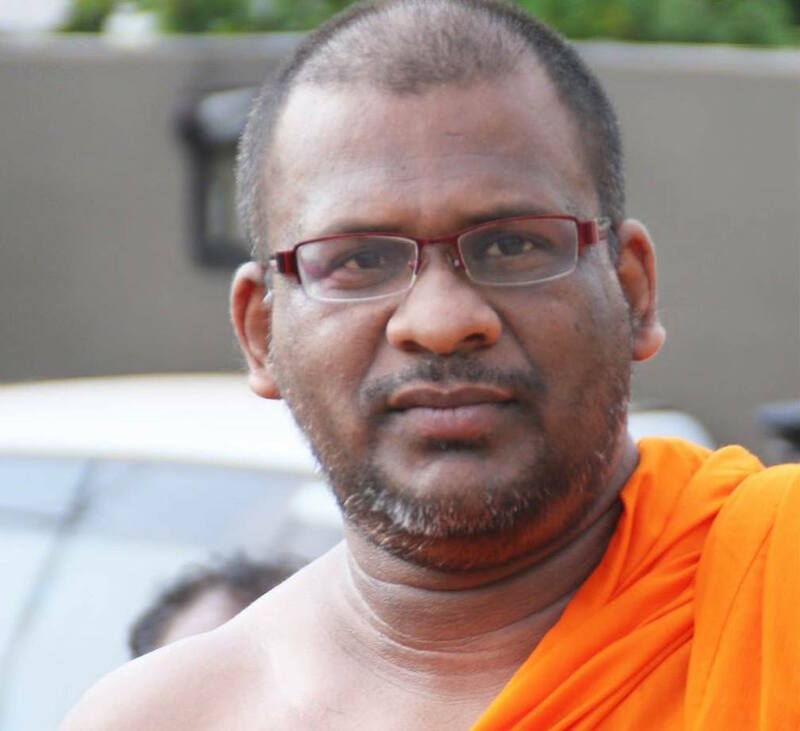 Bodu Bala Sena strongman Galagoda Atte Gnanasara can no longer be considered a Buddhist monk as per the vinaya rules elaborated recently by Rev Medagoda Abhayatissa considering the fact that all prisoners are treated equally by relevant authorities. Rev Abhayatissa, speaking at the Sunethradevi Pirivena, Pepiliyana, said that according to the disciplinary texts, the Vinaya Pitakaya, a bikkhus who spends seven days out of the robe can lose his status as per the rule cheevara vippavaasi (residing out of the robe). Superintendent of the Welikada Prison Chandana Ekanayake speaking to Colombo Telegraph today reiterated the opinion of Commissioner General of Prisons H.M.N.C. Dhanasinghe who stated that all prisoners are treated equally. Therefore, Gnanasara, who is serving a year of hard labor in prison, like all other prisoners, would be expected to be forced to wear prison garb or the ‘jumper suit’ in common parlance. Since he began his term on June 14th, today would be his seventh cheevara vippavaasi day. His status as a bikkhu automatically expires today. Courts had to interfere since the Mhanayaka’s failed in their duty by convening a Sangha Adhikaranaya and investigate the recalcitrant monk.Unless even at this very late stage Mahanayaka;’s do their duty and wean away Dussila monks from the Sasana Buddhism will not survive the predicted 5000 years but end during the next 100 years sad to say. If Arahat Sariputta were to be abducted, disrobed and then kept in solitary confinement for 1 month, would he be not be considered as a monk anymore? The whole problem started in 1956, when he invited the Buddhist monks to participate in his election campaign. Rough monks like, Mapitigama Buddharakkitha, Thalduwe Somarama were those who were in the forefront. Erudite monks like Walpola Rahula, Udakendala Sranankara, Bambarende Siriseewalie did not respond to Banda’s call. Everyone knows the end result. Buddhrakkikatha died in jail, Somarama was hanged. Our children lost the English education. That’s why our cricketers poor response at international conversations. Rouge monks galagodaaththe Gnasara, Ittekande Saddatissa and many other goats emerge due to the foolishness of Banda. Whether what he said is right or wrong, the way he said it is the question. Let him have a chance to start as a novice monk (if sought). It is a shame to compare this wayward monk who is used to breaking all the Vinaya rules to the most sacred Sariputhra who is venenerated all over the Buddhist world as the Arahat next to Lord Buddha! Please desist from making such idiotic statements which will end up in you being born in Niraya or as a animal in your next birth! I was told that the government deliberately jailed Ven Gnanasara becuase he likes rough men and he will enjoy the prison term. So who is the loser here. Not Gnanasra, because he is enjoying men’s company. in the name of Gnanasara . He is already out on bail . it is reported . Gnanam is a Sinhala Buddhist Monk. His arrest, his bail, his release is not any business of Tamil Eelam. But the truth of SINHALA ONLY JURY VERDICT has to come direct under Sun light. That is why we opposed postponing his bail hearing. Arabian Commission was used to arrest Gnanam and protect the Royal Hitlers. Now the account is balanced. Now if Sandhya ask for justice they will not be able to put drama of arresting Gnanam for Arabian Commission and pretend like they are serving justice. Sandhya has protected her from these Arabian Bribe games cannot make her side of the case dusky or marooned. What she needed is those who ordered Army high officials to torture and kill Eknaligoda have to be punished. Those barbaric Wildlife monsters cannot pretend that they are White Aryan Hitler’s race and better managers. Mallaiyuren: All those Tamil suicide bombers and Black tigers in the jail, what should be carried out to them. Provide comphensation as digambaran needed. Did you ask what can you do with the New King from Sirimavo. At least ask Pillaiyan what was his idea and who told him that. Gnanam is not disrobed. I saw the release video (6-22-18). He was still wearing his Thavani. He was quite happy and other bald heads looked very proud of their achievement.